Celery is one of the foods that tends to go limp in my refrigerator. I do not use celery as much in recipes as, say, onions or carrots. I never enjoy throwing out the limp celery, and set out to find a way to save as much as I could of my purchase. Try 1: Make lots of celery recipes in the same week. A week is about how long fresh celery holds up in my refrigerator before becoming limp. 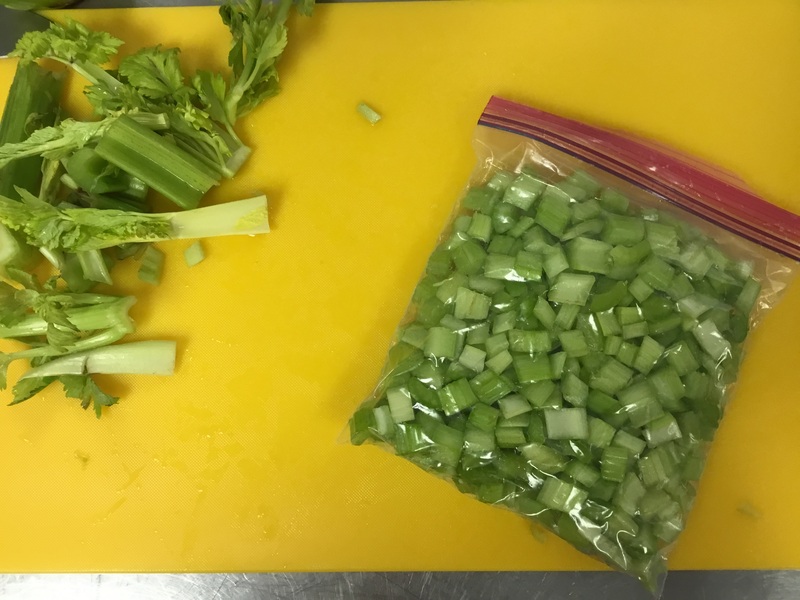 After three recipes in a week – and the leftovers – I decided it was too much celery for my taste. I needed more veggie variety. Try 2: Cut into approximately 4-inch pieces and put – unwashed – in a sealed container in the refrigerator. This one worked better. It helped keep my celery in good condition for almost 2 weeks. It did start to get slimy and turn brown in color towards the end. Try 3: Freeze chopped celery. This one I really like for saving extra celery and having it pre-chopped and ready for cooking. I know I cannot use this frozen celery in raw dishes, like to snack on or in potato salad, and that is okay by me. I tend to cook more with celery than eat it raw anyway. The National Center for Home Food Preservation has these instructions on freezing celery. I skipped the blanching step. Blanching stops enzymes involved in decomposing foods, so frozen foods last longer. By not blanching, I know my celery will have poorer quality the longer it sits in the freezer, so I have been making sure to use my frozen celery within two months. What food preservation and food waste tips do you use? Share in the comments! Today's post was written by Caitlin Mellendorf. Caitlin Mellendorf, MS, RD, is a registered dietitian and Nutrition & Wellness Educator serving DeWitt, Macon, and Piatt Counties. She teaches nutrition- and food-based lessons around heart health, food safety, diabetes, and others. In all classes, she encourages trying new foods, gaining confidence in healthy eating, and getting back into our kitchens.